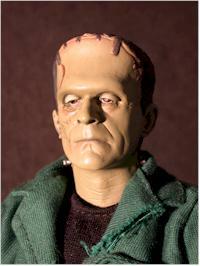 There haven't been many Universal Monster releases from Sideshow since January. 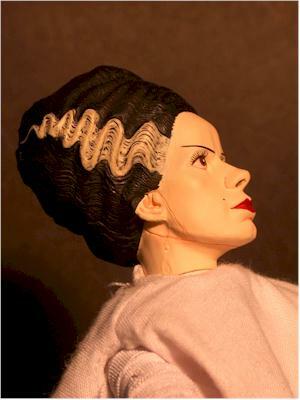 The Bride of Frankenstein figures had been delayed a couple times, but finally made it out this month. 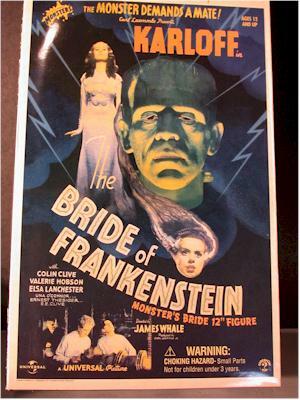 The set includes the Bride herself of course, and the Monster version with the facial and outfit damage sustained by the creature. The suggested retail on this is $40 each, but you should be able to find them cheaper. The Sideshow packaging continues to rock. It's beautiful to look at, collector friendly, and just plain well done. They could have cheaped out here and given us the same box cover art, but instead they've given two different boxes, with nice shots of each character on the back as well. 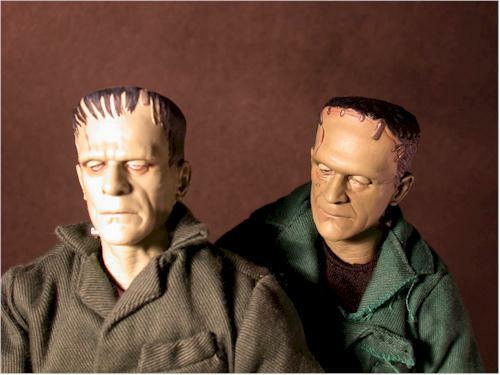 Of the two, the sculpt on Frankie is the best. He's perfect, with the damaged forehead and cheek. The details on the sculpt are even better than the previous versions. Elsa is also quite nice, and in profile looks perfect. The front view might look a little chunky to you - it did to me at first - but if you compare to the photos on the box, I think you'll see that they did a great job capturing her. My only real complaint is on her scars. They aren't nearly as pronounced in the photo, and if they were, the figure would look quite a bit better. No major complaints here. The face details are well done, and the accessories are also well painted. 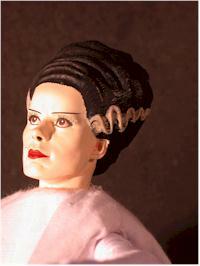 My complaint here is the same as in the sculpt - the scars on the neck and throat of the Bride aren't pronounced enough. It's partially a problem with the sculpt, and partially a problem with the paint ops. The bodies used are the same as usual. This is the skinny female body from Buffy, and the usual male body. The articulation is great, and both Frank and the Bride have decent neck articulation, something that tends to come and go on Sideshow figures. The only knock here is that we've lost the wrist articulation on the Frankenstein that we had the first time around. One of Sideshow's strengths is their accessories. They didn't fail here, and gave a good variety. 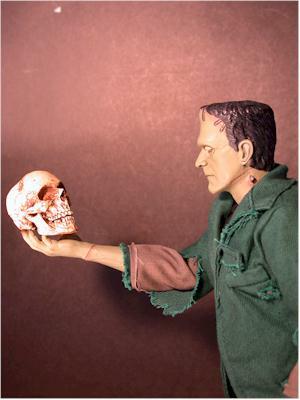 Frankie comes with the usual foot stand, but also a nice pile of bones and a great human skull with hinged jaw. It's a little light on the accessories, particularly at the $40 price point, but I'll hit him up for that in the value section. The Bride comes with a much better stand, similar to the ones included with the Dark Crystal figures. It attaches around her waist, and works very well, although I had no trouble getting her to stand on her own. She also comes with a heart, and two very cool pieces of lab equipment. 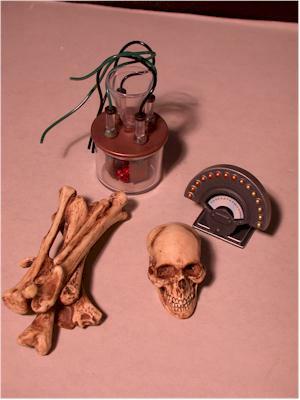 These would look great on a table from the lab, along with the table for Frank to lay on. Are you listening, Sideshow? 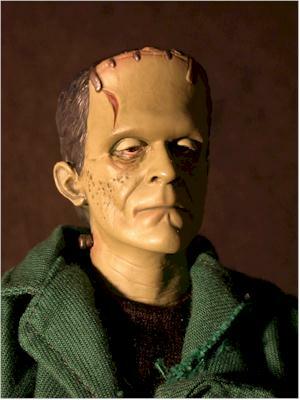 The costume on Frankenstein is a re-use of course, but it's also an improvement. 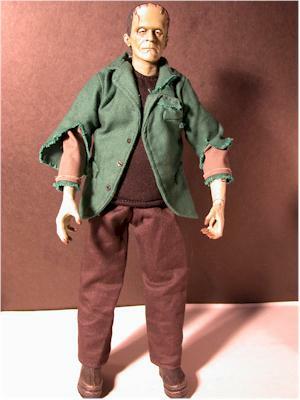 The jacket and tank top are padded in all the right places to give him a much larger appearance than the first Frankenstein had. There is also 'battle damage' on the jacket where appropriate. The quality is great, with excellent seams and snaps use everywhere they should be. 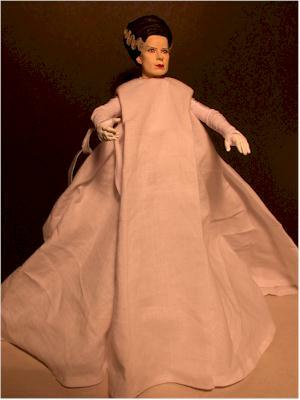 The Bride's costume is certainly large, although not as complicated as it might have been. The top dress flows out all around her, and is well done, if plain. Underneath she's wearing a white body stocking, with wrappings on the legs, arms, and around the torso. The value score is based on other figures of this same type in this same price range. Dragon or bbi give you more accessories for your dollar. Of course, these are licensed, whereas the Dragon and bbi products aren't, so that accounts for some of the discrepancy. If you check out some of the links below though, you'll be able to find these for less than $40 each, and that improves this score. Sideshow continues to impress me with their Univeral Monsters. I'm disappointed that we'll only get a couple more new ones this year, but that's better than the line ending. I'm hoping that next year we see even more, and after their recent polls at their website on what monsters to produce, I'm betting we will. - Sideshow themselves of course. Retail is $40 plus shipping. - Atlantic Toys has a great price at $27.95 each plus shipping. - TNC Universe usually has a good price, although you'll have to call since they don't have the price on this one listed yet on the web site. - War Toys have them cheap at $25, but it isn't clear if they have both the Bride and Frank, or only Frank. Check under the boxed Sideshow figures on their site.